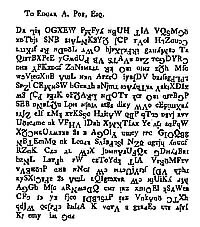 The nineteenth century author, Edgar Allan Poe frequently included ciphers and codes in both his poems and prose and one cipher allegedly sent to Poe by one of his readers, W B Tyler, remained uncracked. A panel of American academics was set up to judge solutions to the Challenge, supported by Williams College with a $2500 prize, which was officially launched on 23 February 1993. The Challenge gained popularity in 1998 when Bokler software sponsored a website for the Challenge. A solution would help settle an academic debate as to whether Tyler was, in fact, Poe's nom de plume. The Challenge was originally published in December 1841 and has remained uncracked until now. Gil Broza, an Israeli software engineer living in Canada, solved the puzzle in October 2000. Full details are on the official website.